Waking up on Saturday, we headed out to Oxford from Cincinnati, a 45 minute drive on a road that should be a major highway but wasn’t. We made a quick stop at IHOP for breakfast, where Al uttered “I love IHOP, it is clearly better than Denny’s.” There goes the Denny’s sponsorship, but we now have room for IHOP to come on board. I am expecting a call from their national director of marketing. I hope Nate enjoys that Halloween pancake with the candy corns. Upon arriving in Oxford, we drove directly over to the stadium to try to get in some early photos before the fans arrived. A nice guard allowed us in to get a few quick snapshots but there was no getting on the field this close to game time. Plus, unknown to us we had parked in the President’s parking spot (they really should mark that spot) which made everyone nervous. We moved the car very quickly after finding out, lest we find ourselves in an Oxford holding cell. That being done, we found a more permanent spot for the car which was quite a distance from the stadium. After some quick shopping so Al could find a shirt for the second red out of the weekend (Cincinnati had a ring of red game the night before), we headed to the stadium for the game. 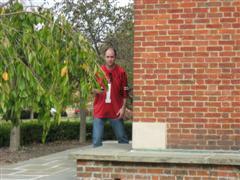 I find it odd that the bookstore did not open until 12pm on homecoming weekend when game time was 1pm. Seems like a lost business opportunity there. My wife thinks this sounds a lot like URI. 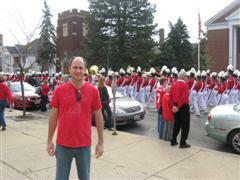 We got caught up in the homecoming parade, which means I can now say I have been to a homecoming parade. We spent a little time in the tailgating area and at the homecoming pep rally, but there really was not that much to see and do. 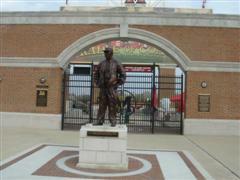 We went into the stadium and I have to say that I was somewhat impressed. The stadium itself was not much given that it was just a few sideline stands and capacity was 25,000. But given that, they have done quite a bit with it. The Cradle of Coaches area was quite nice. 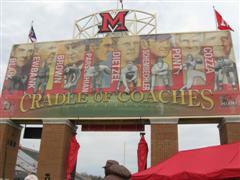 There is a monument on the opposite side of the scoreboard and they unveiled bronze statues to a few of the coaches during this weekend. It was quite nice. The way the stadium is laid out, you can get really close to the field. This was also good because you could get really close to the players and all others on the field including cheerleaders. The field itself for lack of a better word, popped. I am not sure if it was the paint job or the turf itself, but it really did pop. I think this is a good time to point out that Al must have said “I want to be a cheerleader” at least 20 times on this trip. Never mind that he does not possess the skills necessary such as being able to do a back flip or being able to hold up an 80 pound coed. He might be able to be a mascot that doesn’t do anything acrobatic. He did say he was willing to do “anything” to be a cheerleader, even if that meant building a building on campus or bribing a male cheerleader to go missing for one game. The game was interesting. Al picked Miami and I picked Ohio, so we had opposite interests. It started very badly for me as Miami took the opening drive for a TD. Ohio then fumbled the resulting kickoff and Miami drove to the nine yard line before imploding and having to punt from Ohio’s 48 yard line. 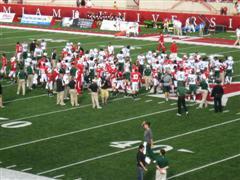 Ohio lead at the half 13-7 but neither team looked good. Ohio took control in the third and went up 27-7. Miami tried to come back and Zac Dysert hit Nick Harwell for what looked like an easy 82 yard TD pass. But the replay official ruled Harwell dropped the ball before crossing the goal line giving Ohio a touchback. Harwell was untouched going into the end zone and simply didn’t cross the goal line before celebrating. Normally I would advocate cutting such a player immediately. But Harwell had 219 yards on 11 catches and is a freshman. One would hope he learns his lesson. Take note, there is a reason you hand the football to the official in the BACK of the end zone. Also loved the fake punt where the defender never turned around and followed the gunner all the way down the field as the ball carrier was directly behind him. It’s called ball awareness! 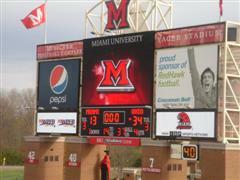 Miami never got closer than 14 after that and Ohio won 34-13. I have to point out that the end of this game was ridiculous. Neither team could kill enough of the clock to end this game quickly. Miami repeatedly snapped the ball too early in the play clock while running the ball to end the game. Instead of it ending on their possession, Ohio took over and then took an illegal substitution penalty with 10 seconds left. Game should have ended 10 minutes sooner. Additionally, while it did not rain, there were a few drops of precipitation during the game. I guess I should insert here example number two (example one is in the previous games write up) of how I was way off my game on this trip. 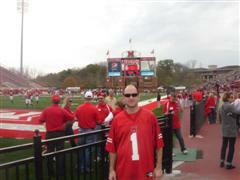 I proceeded to berate Ohio for not declining a penalty after a poor Miami punt. Instead they opted for a re-kick. Of course, the penalty was on Ohio, so it was Miami that opted to re-kick. During my lambasting of Ohio, I had one of those Gilda Radner / Baba Wawa moments, “Never Mind”. This leaves my record at picking games at 5-4. Since we are picking without the spread, that is not that impressive, but Al is 2-7. That is just downright pitiful and I think Nate should start doing Al’s picks. Of all the games that we could have gone to on this day; Connecticut @ Louisville, Purdue @ Ohio St., Georgia @ Kentucky or Ohio @ Miami none of them looked like real exciting games so I guess we did not blow that call too badly. Our thinking was this; UConn vs. Louisville was out as we could not justify two UConn games in one year. Purdue @ Ohio State was ruled out as we want to do Ohio State by itself and not part of a doubleheader. Georgia @ Kentucky was not exactly a compelling matchup this year, although that game turned out to be quite close and high scoring. After the game we walked around campus. This is a very beautiful school in more respects than one. I love the brick buildings and the overall aesthetic of the campus. But I must agree with Al that the yellow trim on the windows and doors did not really fit. But I call his assessment of “brick buildings and throw-up yellow windows” as being too harsh. The talent level in Oxford was very high. Not a lot of boots but lots of black tights and stretch pants. This look does not work for everyone, but it looked good for most. And is everyone who goes to Miami University 5’4, blond, and 110 lbs? The diversity officer has some work to do. Unless that is what they are going for. Of course, this is a very unscientific observation and I am sure the official enrollment figures state otherwise. 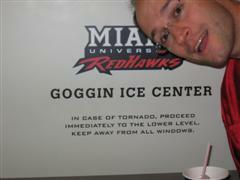 After wandering around a little bit and not finding a place where we could get in and have dinner, (Paesano’s had a 2 hour wait) we headed over to the Goggin Ice Center for a RedHawk hockey game. I wanted to get there early to ensure we would get tickets due to my belief that it would be hard to get tickets and that 95% of the building was season tickets. I also felt there was a good chance there would be more people at the hockey game than at the football game despite the knowledge that capacity was only 3,500. Plus Singerpedia says “Miami is pretty good at hockey”. 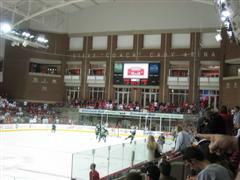 I have never been to a college ice hockey game and was looking forward to it as I am a big hockey fan. After waiting in line for awhile we got seats and since we did not yet eat, dinner was at the concession stand, where I was tricked into a Starbucks hot chocolate. I purposefully avoided the Starbucks counter and ordered a hot chocolate at the regular concession stand, only to find it was Starbucks as well. The game was a lot of fun as Miami won 9-1 over Northern Michigan. Great atmosphere! Great venue! They need to get some of the hockey fans over to the football stadium. The only problem was that it was colder in the arena than it was outside at the football game the night before. Singerpedia says that the second intermission synchronized skating was really more like choreographed skating. But it was still very impressive. Love the chant…. “1,2,3,4, etc. we want morrrrrrrrrrrrrrre goals. It’s all your fault, it’s all your fault, it’s all your fault, it’s all your fault”. Best wishes go out to Will Weber who took a skate to the neck! Ok Al, enough time has passed. 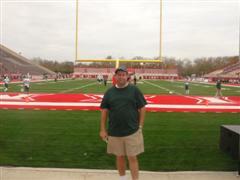 After hockey, it was back to Yager Stadium to see if we could get onto the field for the traditional kicking of the field goals. No luck as it was all locked up. The peanut gallery, my wife, has chimed in that we would not have made them anyway. We then went to take a picture by the entrance sign to the University. For the second time we were stared down by a wild animal. Upon approaching the sign we saw what appeared to be a statue of a deer. But it was not a statue. It was real (and spectacular) and did not feel like moving for us. If I took another step before it fled, I would be the one fleeing. 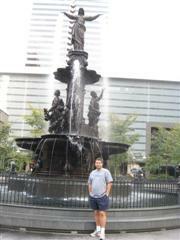 We returned to Cincinnati and went over to the WKRP fountain. I think it’s really called Founders Square. We had an awful meal at the Rock Bottom Brewery. A piece of advice, never order the Mongolian beef there. We should have known it was trouble when we were not asked how we wanted the beef. The varieties of beer were also hit and miss. The next morning we awoke and attempted to go to the WKRP sites. We found ourselves in an elevator possessed. Not really, the electronics were just calibrated so the floors were two off from the actual floor. This meant we could not reach the lobby via elevator. Have I mentioned before to avoid the Hyatt Regency Cincinnati. 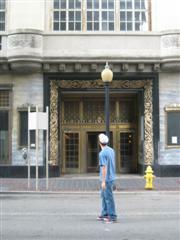 We eventually made it out and to the WKRP sites. Nice fountain but not so nice Enquirer building. Either tear it down or restore it. Now it is just an eyesore. 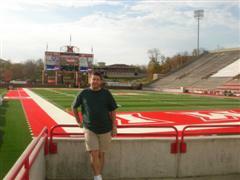 Back to the University of Cincinnati and the often imitated, never duplicated kicking of the field goals. We had no problem getting onto the field at Nippert Stadium. 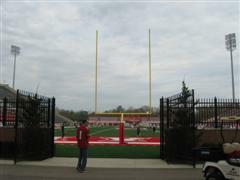 The first observation was that the goalposts were crooked. Really crooked. Hopefully they were not like that during the game. Al actually made a 32 yarder with the video on his camera running. Or so he claims. I have yet to see the video evidence (despite what my actual eyes have seen). That makes him about 2 for 30 if his two claims are correct. A nice family was taking their Christmas card photo from the field. Al declined to take his due to it leading to divorce or something like that. Did I mention how boring these drives can be. Upon arrival at the airport, we got simultaneous phone calls about our plane being delayed. This meant one thing, to the bar to watch NFL football. We eventually boarded a new plane. I know this because instead of a no smoking light there was one that said turn off electronic devices. According to Singerpedia, that is the sign you are on a plane that was built after 1980. 1980 is the year of demarcation in the airline industry such that everything built after 1980 is called new. We returned home a little bit more damaged than when we left with our wives none the wiser. Hey Alex – you need to put any game we are at on the sheet! C’mon, who else is doing something as crazy as this! 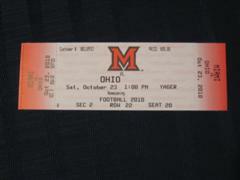 Unbeknownst to us and probably the players in this game, this game was the deciding factor in the MAC’s East Division. Despite losing this game, Miami finished with a 7-1 conference record to edge the 6-2 Bobcats for the East Division title. 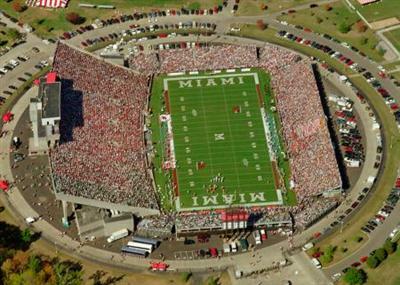 Miami would beat #25 Northern Illinois in the MAC title game and go on to beat Middle Tennessee in the GODADDY.com bowl giving them a 10 win season. This game was the only conference loss for Miami on the year. We never would have thought that after watching this game.